Is it time for you to get Relationship-Ready? Kindle and paperback at Amazon. A former friend once said to me, “I could have had him.” She was talking about the man I was in love with, who is now my husband. This person viewed ‘getting’ a relationship as if it were a fishing expedition. What she missed was that finding a true love relationship has nothing to do with fishing and a lot to do with becoming a person someone else wants to be with. What needs to be developed in ourselves? Who have I picked or who do I usually pick and why? And if you are already in a relationship, what do we need to learn in order to make our relationship work? Creating a true love relationship with another asks us to develop specific qualities in ourselves. 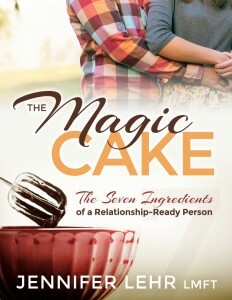 These qualities or ingredients are the key to “making a magic cake” with our beloved. Making this magic relationship also requires that we trust we can manifest this person – a person who we love, a person who adores us and who wants to build a relationship with us. In this book, you will read stories about other couples and their struggles as well as some of my own stories. You will learn what makes a relationship work, and what does not. And you will be guided to develop these ingredients, becoming that person who can manifest the relationship of their dreams.